By pharyngula on July 8, 2016. This is kind of awesome: cephalopods only have one kind of photoreceptor, so it was thought that they would be only able to see the world in shades of gray. Those amazingly clever camouflage tricks they pull? That was just matching intensities and textures, fooling our eyes. But now someone has figured out a way they could see color, and special bonus, it also explains those funky weird pupil shapes, like you see in the cuttlefish eye to the right. They use chromatic aberration! We think of chromatic aberration as an imaging problem -- it's caused by the fact that the degree refraction of light is partly dependent on wavelength, so the blue light in an image focuses closer to the lens than the red light. When you focus optimally on the green wavelengths, for instance, that means that the red and blue colors form an out of focus, blurry image on top of the sharp greens, producing a pattern of color fringes around objects. They jump out clearly to me when I use the cheap student microscopes here, and are why I spent a lot of extra money getting planapochromat lenses for my microscope. They have lots of corrective glass to tweak the different wavelengths into the same focal plane. But where I see an annoyance, cephalopods evolved an opportunity. Where an object comes into sharpest focus on the eye can actually tell you what wavelengths are -- so by focusing backwards and forwards on something, they can extract a rough idea of its color. And that leads into the next nifty explanation. Where I want to minimize chromatic aberration, cephalopods want to increase it…and as it turns out, having weird off-axis apertures causes more disparity in the focal plane of different wavelengths of light, which makes it easier to discriminate color using this mechanism. Chromatic blur and pupil geometry. The (A) full and (C) annular aperture pupils produce more chromatic blurring (CB) than (B) the small on-axis pupil, because they transmit rays with a larger ray height h. Vertical lines show best focus positions for blue, green, and red light. It's settled then. Cephalopods are cleverer than we are. Or maybe it's evolution that is smarter than we are. One of those two. Our colour vision is based on the sensitivity of different chemicals to different wavelengths of light. 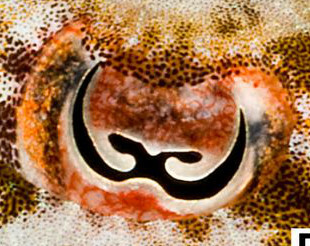 Cephalopod eyes effectively measure the wavelength of the light. That might give their colour vision greater range and accuracy than ours. Computer monitors make yellow by combining green and red light. We can't distinguish that combination from actual yellow light (e.g. directly from a prism), but to a cuttlefish presumably they would look very different. Re: It’s settled then. Cephalopods are cleverer than we are. Or maybe it’s evolution that is smarter than we are. One of those two." My comment: Anna Di Cosmo's group has linked epigenetically-effected chemotaxis to phototaxis in all invertebrates to all vertebrates via olfaction and pheromones. All experimental evidence of biologically-based cause and effect extends the conserved molecular mechanisms of energy-dependent chromosomal rearrangements to all biodiversity without any claims about evolution. Also, energy dependent chromatin remodeling inactivates activity genes and regulates neural coding in the context of RNA methylation, learning and memory. That fact links the sensory environment from the epigenetically-effected innate immune system to all RNA-mediated biophysically constrained biodiversity via fixation of amino acid substitutions in the context of the physiology of reproduction and protein folding chemistry/supercoiled DNA. As you know, the links to chromosomal rearrangements and all biodiversity have been clear to all serious scientists for several years. Others should see your attack on my credibility for comparison. Excerpt 1) "...the phenomenon, which takes place where two sub species meet, is the first step in the transition of the two sub-species into two true, non-interbreeding, species." Chromosomal fusion has been linked to invertebrate speciation and chromosomal rearrangements have been linked to vertebrate speciation via the nutrient-dependent pheromone-controlled RNA-mediated cell type differentiation of species from microbes to humans. Each time new experimental evidence of biologically-based cause and effect proves that PZ Myers is biologically uninformed, he refuses to respond and then disables the ability to post more comments. Watch for that to happen again, here.